The setting of a dining table plays in an important part towards attracting the attention of your guests at a dinner party. 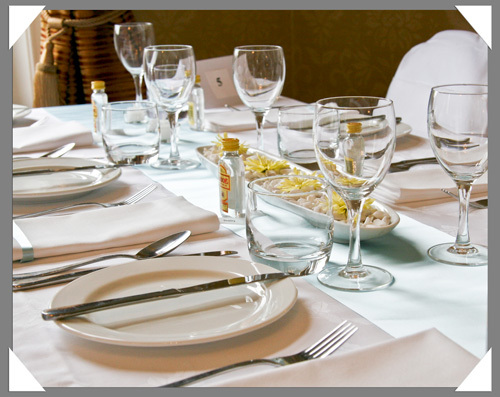 Dining table setting varies slightly from meal to meal but certain things such as the position of cutlery and dishes remains the same. Here is what you will need to lay a dining table properly. Cover the dining table with a clean tablecloth. Make sure the tablecloth is even on all sides of the table. To prevent the cloth from slipping in case it is made of slippery fabric, tape the cloth to the table from underneath with small pieces of double tape. Placemats come after the tablecloth. Place placemats on the dining table, keeping the placemats centred with the chairs. Each placemat that you use should be approximately 1/2 inch away from the edge of the table. Make sure that placemats complement the colour of the table cloth. Set a centrepiece of medium height in the dining table’s centre. Make sure the centrepiece you use matches the theme of the dinner. For instance, if it is a Valentine’s dinner, use a flower arrangement. Now set the necessary condiments such as salt and pepper shakers and a butter dish. Place these condiments in the table’s centre. Place dinner plates in the centre of each chair and place a soup bowl on each plate. Make sure that the dinner plates are placed a few inches away from the edge of the dining table. Point the blade of dinner knife towards the dinner table and place it on the right side of the dinner table. Set the teaspoon and soup spoon one after the other to the right of the dinner knife. Make sure the bottoms of each utensil are properly aligned with each other. On the left side of the dinner plate, set the dessert fork. Set the dinner fork and the salad fork one after the other towards the left of the dessert fork. As before, make sure their bottom ends are aligned. Place a vertically folded napkin to the left of the dessert, dinner and salad forks. Lay a butter knife across the bread and butter plate. Place this plate above the three forks but keep the plate to the left of the dinner plate. Finally, on the right hand side of the dinner plate, place the water goblet, followed by red and white wine glasses one after the other to the right of the water goblet. At the end of the goblet row, place a coffee mug upside down.